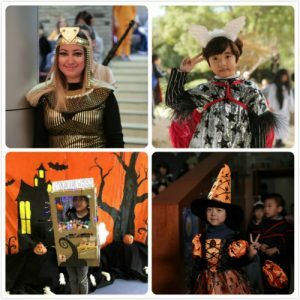 ShangYin | Thrilling Halloween day! Shang Yin celebrated yet another thrilling Halloween day! 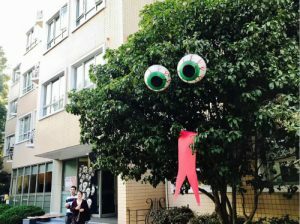 The Shanyin Spooktacular theme invited all students to dress up in costume; scary, funny, creative. We saw it all! 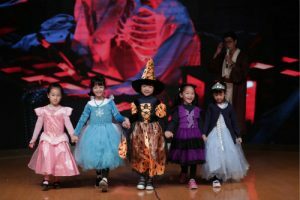 Not only was the morning filled with Halloween classroom learning activities, but Shang Yin had its first ever Fashion Show. 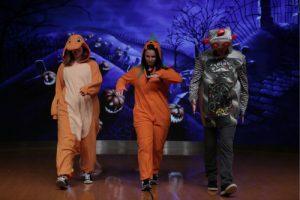 Students gathered in the music hall to watched and cheer on classmates’ costumes. They then had chances to gain House points through our exciting House Games. In the afternoon, parents were invited to join in on the fearsome fun in a costume of their own. Year 1 and Grade 1 organized a rotation of Halloween activities, where students had the chance to enjoy a new activity in each class. Grade 2 to Grade 5 students and parents were able to explore the creepy classrooms on their own. 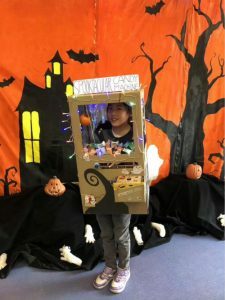 While walking the halls, students were able to admire each class’ decorated door, go trick-or-treating, taste some delicious “Frog Eye” juice or snap a memory in the photo booth. And of course, a Spooktacular day would not be complete without our classic Haunted House that invited brave students for a sinful scare. 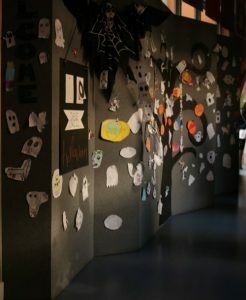 In order to allow students to fully feel the festive atmosphere of Halloween, Shangyin created a “Devil’s Forest” and a “Fantasy Haunted House”. After lunch, the children put on makeup and costumes to prepare. Before long, vampires, witches, zombies and ghosts were coming and going in every corner of the campus. Together, we made a variety of scary action. Even the teachers joined into the fun. Following the Haunted House action, the student took on a “pixel map contest.” The children of the middle school filled in charts with different colors of sticky notes; and soon the children completed great pieces of Art work. The first floor of the corridor instantly became a sticky-notepark, where we could enjoy Snow White, Super Mario and other cartoons vividly covering our windows. In the Elementary classes the students used the doors to create their “pixel maps”. In the Lower-grades children used 7.5cm * 7.5cm convenience stickers to spell out a variety of fruits. The middle-aged children used 5cm * 5cm smaller models of convenience stickers to create a variety of cartoon characters. The back door of each classroom was soon decorated with colorful, vibrant images. The children are also in this activity to understand the importance of team cooperation, you help me, I help you, and the most beautiful scenery is made together by all of us! Shangyin has always adhered to the integration of Eastern and Western cultures, every activity is carried out with international understanding of education, to help children more deeply understand the Chinese and Western culture, and cultivate children’s international perspectives. 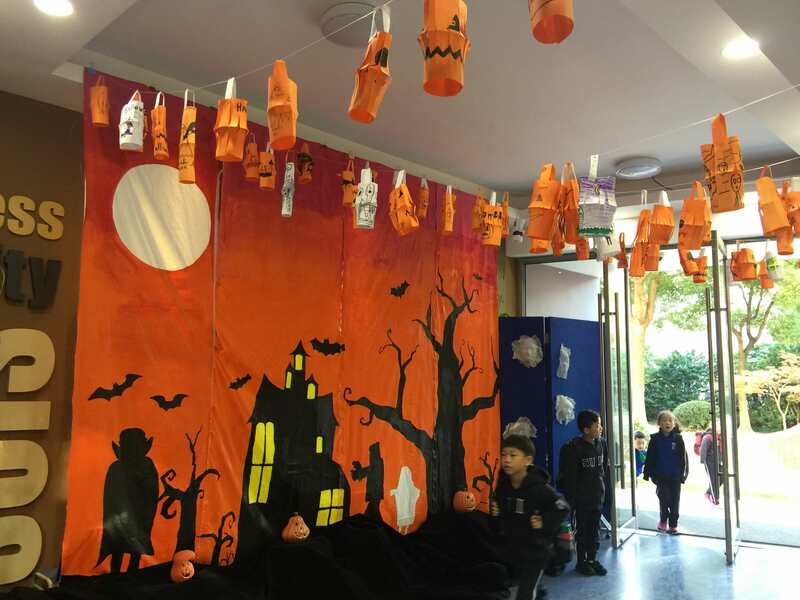 Our Halloween celebrations would have not been possible without the help of the art team, parent volunteers, and our Halloween committee. They all put time and effort into creating stunning displays and a successful event.